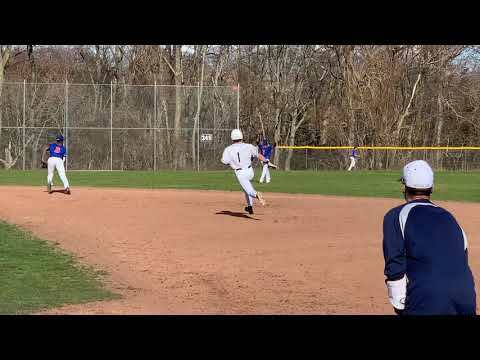 WESTPORT — It was instinct, Staples coach Jack McFarland said, that prompted him to jump Zack Zobel up two spots from his customary fifth position in the batting order for today’s game against Danbury. Zobel rewarded his coach’s prescience with a 3-for-3, five-RBI performance to lead the Wreckers to a 6-4 home win. Staples needed all of Zobel’s production because the Hatters made strong contact against its two best pitchers, and had the tying runs in scoring position in the seventh with one out against Chad Knight, working in relief. Knight got out of the jam by inducing Connor Corcoran to hit into a double play, started by shortstop Andrew Moy on a slow roller. The Hatters (2-3) had nine hits against Harry Azadian, who went the first 4 2/3 innings and allowed two runs, and Knight. Despite good at bats, Danbury was held scoreless the first four innings and was unable to make up an early 4-0 deficit. Azadian is now 4-0 against the Hatters the past two seasons, including postseason games. Zobel, who is now 6-for-7 in the two games he has batted third, staked the Wreckers (4-1) to a quick lead with a solo homer in the first. The next time Zobel came up, in the third, the bases were loaded after two walks and an error. Zobel drove a ball to the fence in center to bring in all three runners and make the score 4-0. “I was just trying to hit something hard honestly,” Zobel said. It was the scenario McFarland envisioned when making the lineup card. Staples was economical with just five hits; Jake Damico had the other two and followed Zobel’s RBI single in the fifth with one of his own. Danbury had scored three times in the top of the inning on an RBI single by Justin Solimine and two-run base hit from Spencer Barnett. Both players finished with two hits. Barnett’s second made it a two-run game in the seventh and brought Corcoran to the plate. Ratchford, one of the sport’s more pragmatic coaches, was not overly concerned after his team’s second close loss in three days. McFarland said he is pleased by what he has seen from his team a quarter of the way through the season. “We have some things to iron out but I like the lineup, I like the pitching,” McFarland said. It is a word no program likes to have as a tagline, but even the members of the Staples baseball team have conceded, prior to two weeks ago, the previous 14 months had been one of underachievement. Last year there were injuries, this spring a slow start. The Wreckers opened a year ago as a state favorite and failed to qualify for their conference tournament. Two seasons, one postseason victory. Ben Casparius, whose arrival at Staples High School was trumpeted after his accomplishments at the youth level, was an early commit to the University of North Carolina and carried a long burden of living up to the high expectations, this morning was named the Gatorade Connecticut Baseball Player of the Year.